Some days you just want to get up, look into your binder, and find the most lovably lazy shenanigans you can pull off. And sometimes they end up making a surprisingly cohesive strategy. I’m not saying you’re gonna find a new Night March deck every time, but it’s good to look at those Commons and Uncommons sometimes, ya know? Pachirisu is a Basic Lightning Pokemon, 70 HP, with a Fighting Weakness, Metal Resistance, and a Retreat Cost of 1. And his artwork is ADORABLE!! He’s got two attacks, both costing a Lightning Energy apiece. One of these is Nuzzle, which for a coin toss has a 50/50 shot of Paralyzing the opposing Pokemon. Good for stalling, but the risk isn’t worth the Active slot. What is worth the Active slot is Snuggly Generator, an attack with a cutesy name that lets you attach a Lightning Energy from the deck to each of your Pokemon that has the Nuzzle attack. There’s a few Pokemon that benefit from this, including a Togedemaru promo and Dedenne from Phantom Forces, but the one that really stands out is Pikachu from Generations. There’s another in XY you could use in the Expanded format as well, and the reason you’d use Pikachu specifically is Raichu-GX (SLG). The reason being that his Powerful Spark attack gets stronger the more Lightning Energy there are in play! There may be other big cards…or, I guess, Pikachus, that Pachirisu might be able to partner up with, as long as they have Nuzzle. It may not be much, but having the ability to pull out a lot of Energy from the deck is great, as it thins your deck out and improves your chances of drawing a good card! Arora Notealus: Pachirisu shows a lot of promise, but the card pool from which he can benefit from – the number of Pokemon with Nuzzle as an attack – needs to be bigger. Right now, your choices are between two similarly small and frail Pikachu variants, and…well, Pikachu. And the reason that one’s so good is more from an Evolution. A GX, but all the same. We need more Nuzzly decks, and I can’t believe I get to say that! Side Review: #10 Dialga-GX – been a while since we’ve looked at him, eh? He had managed to make it onto the list with a bit of praise, but I guess he hasn’t shown up that much lately. Not that it’s his fault or anything – there’s just a lot of competition to face up against, and I had figured that his non-GX moves weren’t going to be able to cut it, even with all the new Metal support. Still, dealing 150 and skipping the opponent’s turn is always fun to pull off, so feel free to utilize him in that manner. Next Time: A surprise promo? In the middle of a review week? Today’s card is Pachirisu from Sun and Moon Ultra Prism. A Basic Lightning Pokemon with 70 HP, weak to Fighting, resists Metal, and a retreat of one, it has two attacks that both costs L energy. Snuggly Generator states for each of your Bench Pokemon with the attack called Nuzzle, you search your deck for a Basic L Energy and attach it to that Pokémon. Pachirisu’s own Nuzzle attack does no damage, but requires a heads coin flip to paralyze the Defending Pokemon. 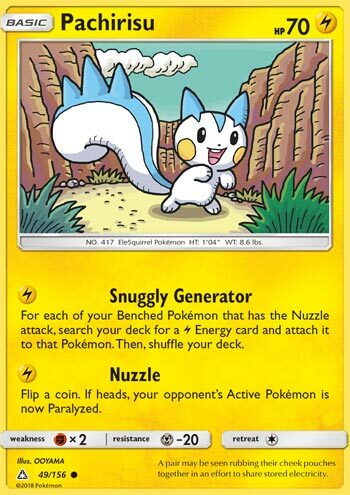 Some of the Pokémon cards with the attack named Nuzzle includes this card, Pikachu (XY, Generations), Togedemaru (SM Promo 44), and Dedenne (XY Phantom Forces. But the best Pokémon to use would be the XY Pikachu because it can further evolve. Raichu-GX comes to mind, since Powerful Spark does 20 plus 20 more damage for each Lightning energy attached to all of your Pokemon. The idea is to start with Pachirisu with as much Pokemon as possible with the Nuzzle attack so that you can maximize the effectiveness of Snuggly Generator. Brigette and Nest Ball can help speed the summoning process. Your opponent may see this coming, so what they can try to do is to outright KO Pachirisu or to reduce your bench size such as Parallel City, Yancy’s Plea-GX attack, or Cyrus Prism Star so that damage output from Powerful Spark is diminished. Overall, this is one instance where Pachirisu would be used, because I can’t see Pachirisu being used anywhere else. In Limited, Pachirisu can’t do damage at all, and it’s hard to capitalize Snuggly Generator since there’s almost no viable candidate to use with. Pachirisu (UP 49) snuggles its way into the meta from the Ultra Prism expansion set. This 70 HP Basic Pokemon will see use for its single Lightning Energy attack Snuggly Generator (aw what a cute name!) which allows you to accelerate energy and attach an energy from your deck to each Pikachu on your bench with the Nuzzle attack. So we went through a little bit of a Snuggly Generator phase a couple weeks ago over on PDC. You have to go down to the comments to actually find the Pachirisu build, but the other guys seemed to have success with it. Myself, I’ve gone 10 W 13 L with a couple of different builds. I don’t know that I have had the best luck with this deck – I did actually play one game where all three of my Raichu GX’s were prized. I think the biggest problem is that there are a TON of good Fighting archetypes out there (including a new Lucario GX that just dropped last week). I have faced Fighting types in 40 out of the 166 matches I’ve played this month. Fighting weakness is just a really bad weakness to have right now. Having said that, this deck can hit for a ton of damage, so if you have a Lightning damage challenge on PTCGO I’d highly recommend it. I think this is probably the best Lightning archetype in the format right now, and it’s not bad, it’s just not something I’d take to a major tournament. Like I said, I know that some people have had success with the Raichu GX Pachirisu Snuggly Generator archetype. I’m 2 W 2 L against it this month, so it’s had some success against me as well, it’s not like I’m totally dominating it. And it definitely has the cutest attack name in the format.